Submitted by peter on 8 November, 2006 - 14:17. Last week I was contacted by Shay Garini, the Managing Director and founder of Thailand's first (only) car testing facility, TestCar Co. Ltd. In a nutshell TestCar is the new best friend for anyone wishing to buy a second-hand car in Thailand, although there are others who will also benefit from their services, but we'll come to that later on. 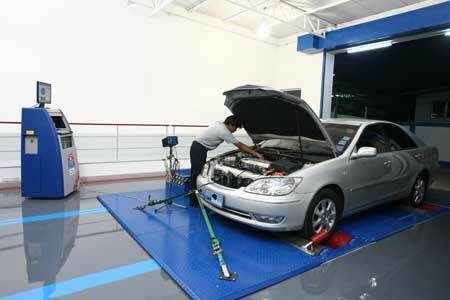 TestCar provides an accredited inspection service using state-of-the-art test equipment. They are fully independent; all they do is test cars. They don't even make recommendations on how to go about fixing the issues they find, but this is a positive point since they have nothing to gain from telling you that your car needs a new part because they are not in the business of supplying it. Mr Garini invited me to visit TestCar's facility, and I would like to share my experience with you here. 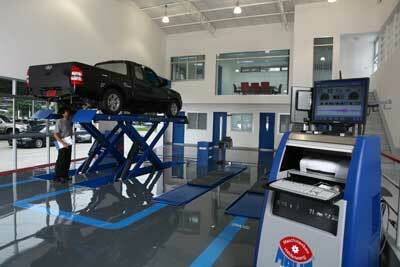 I rolled into the brand new TestCar facility on Srinakarin Road in an early '04 Chevrolet Optra. I was aware of a few minor issues with the car but didn't expect them to find anything major wrong with a car so new. There is no appointment system, and operation is on a first-come-first served basis which is actually very practical given the roll-through system employed. After filling in some basic details handing over car registration, my ID and the keys, I was directed to the test center. There is a railed in walkway running along one side of the test center allowing customers to observe the test process, following their car along as it is moved from one test point to the next. If you prefer you can sit it out in the air-conditioned waiting room. The first piece of equipment is probably the coolest, and the loudest! 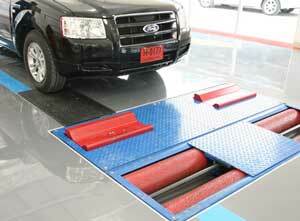 TestCar has one of only two dynamometers in Thailand capable of testing 4x4 vehicles, the other belongs to Porsche. While the car was being strapped down, technicians made themselves busy with multi-point inspections and checks. The test equipment was hooked up and calibrated while a large double-rotor fan unit was wheeled in to provide cooling during the power test. I had never experienced a dynamometer test and, even though the test car was a modest 1.6 liter, the sound of an engine revving at 6,500 RPM was something to behold. I was switching my attention between the car and the TFT monitor outputting the data in real time as the car approached the redline. A few seconds later when the car had returned to idle the display showed the results. The 1.6 Optra managed 100.7 BHP, and revved to 6470 RPM at 163.1 km/h. The BHP figure is slightly down on the 107 BHP specification for the engine. Another useful test performed at this point is the speedometer test which gives you a record of speedo values against actual speed. Nice to know exactly how fast you're going. Next step is the shock absorber, brake systems - including parking brake - and side-slip tests. These are fully automated and are completed quickly. Finally the car was moved to the inspection rig, and after the checks for lights and engine emissions a visual inspection was carried out. The engine bay inspection included battery health checks and every aspect of the engine mechanics was examined. While this inspection didn't take very long, I was told that as much time as necessary will be dedicated to this aspect of the test, and it will take longer for older cars in worse condition. 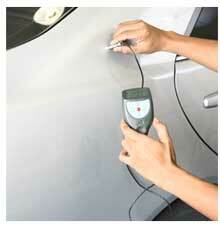 Crash damage is determined through the use of a very accurate paint thickness meter. As Mr. Garini puts it "In the factory, cars are painted by robots. But I don't know of any crash repair shops that use robots." If a car has been repainted there are massive differences in the thickness of paint. This can help determine if the car has been repainted, or if filler has been used to conceal body damage. Although the report will not give a detailed evaluation of the extent of the underlying damage, if any, it will give you clues to go on. And if there is chassis damage this should be caught by the safety checks. Following the test inspection, the car was returned to the car park while I awaited the printout of the results. As you can see from the photos presented here the TestCar facility is immaculate, as you might expect from a new business. Nevertheless you get the impression that everything has been done right, and to a very high standard. The test Maschinenbau Haldenwaig (MAHA) equipment, imported from Germany, is laid out in an efficient well-conceived way. Not surprising then that the founder of the company projects a similar image of professionalism, and attention to detail and transparency. Traits he put to use in the establishment of The Polygraph Center Thailand, a background that he has put into practice in TestCar, even going as far as performing annual polygraph tests on his employees. He explained that this is part of his desire to make sure that everything they do is of benefit to the customer, and any indication of self-serving motivation from the staff would show up in the specially designed polygraph test. The three page report was delivered by a technician who talked me through the details. A sample report can be viewed here. Problems found with my car included engine oil leak, steering system leak, defective cooling belt, dry tires, and improper light settings. To put this into perspective this is a relatively new car, approaching the end of it's 3 year warranty, with a mere 42,000 km on the clock, having just received a 40k service. Further, the Chevrolet mechanics adjusted the headlights during that service. Interesting. The first and obvious use of the TestCar service is for people looking to buy a second hand car, assuming that you can convince the dealer to bring the car down for the test of course. Owners of cars still within warranty can also benefit. I now have a report to bring down to my local Chevrolet service center. With luck and co-operation from Chevrolet I hope to get the problems sorted out while the car is still under warranty. The cost of the test for a standard car like this is THB 3,200. The repairs needed would have easily exceeded that amount had they been discovered after the car had slipped out of warranty. TestCar also offers discounted retests, so you can be sure that the problem has really been fixed. The used car market in Thailand is rampant! As new car sales have continued to rise, second-hand car dealers and tents are bursting at the seams with shiny, well presented cars. And with some areas of the city seemingly dedicated to car tents, you don't have to travel far to find plenty of choice. But the problem is one of trust. You cannot trust the dealer, because they are trying to sell you the product, and of course they are going to tell you that it's a good car. The bottom line is that all the tire kicking in the world won't help you avoid a lemon. Even a test drive could be unhelpful, consisting of a 2 kilometer circuit consisting of driving in a straight line, a u-turn, another straight line, and another u-turn before re-entering the dealers yard. Again you are none the wiser, and probably didn't have the chance to use the full range of gears, let alone gauge the handling or determine if the chassis is true. Without labouring the point, I think we can agree that this situation is not ideal. All the cards are in the dealers hands, if you'll forgive the pun, and you might as well just close your eyes point at a random car and hand over the cash. Wouldn't it be nice if there was some way that you could determine if the car you are interested in buying was a genuine article. This is where TestCar come in. As someone who is considering purchasing a used car in the near future, I am very happy at the arrival of TestCar. For me it opens up the used-car market because I know that for THB 3,200 I will get a clear indication of the safety and quality of the car I'm considering buying, from a source I can trust. I can then buy in reasonable confidence with the 2-month warranty supplied by TestCar, or I can pressure the dealer to have any issues sorted before I agree to buy. Buyers, sellers and owners can all benefit from this service, and ultimately the fees charged by TestCar would seem a small price to pay for peace of mind.